"Who is this red cap that I see afar ?" How can these things actually move ? Every year ends with celebrations, every year also ends with a new Mario Party. A tradition but not quite a routine as we're going to see. 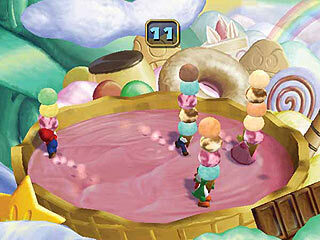 While there was little to expect from the new Mario Party, things turned out different. 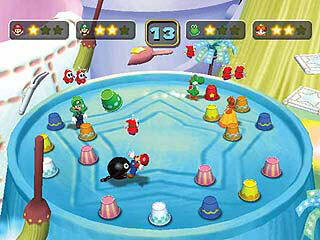 Not for everybody though, many reviews seem to have seen nothing more of interest in this year's Mario Party than usual. Yet, there is, and regular players of Nintendo-Hudson series, as well as attentive players who started on GameCube, will tell you that Mario Party 5 is good, very good indeed, and might be the best episode yet. What's so good about it ? Well, a bit everything. While there's nothing revolutionary as some reviewers were vainly looking forward to, Mario Party 5 does what it knows to do and does it well. There are a few changes (more than usual), one is pretty important in the Story Mode but mostly the game improves the elements of its formula. Boards are better, mini-games too, and the overall presentation is more focused on action than before, you lose less time in menus to access the modes you wish to play. The classic Party Mode hasn't sped up, of all the modes, it's probably the most classic. 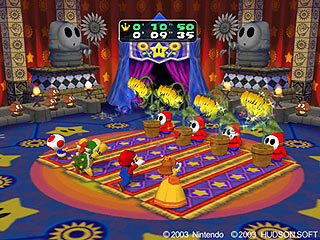 In Mario Party 4, there was the mega and mini system, you could grow giant or tiny, items were bought in shops and there was a ticket draw. All this is gone now, you get capsules instead that have pratically the same powers as items. you get them for free but their use still costs, unless you throw them on the board. That's the special feature of capsules, when it's your turn, you can put them anywhere as far as ten spaces before you, turning it into an event space. Then, if you or any other player lands on it, the effect of the capsule is activated, whether it's good, or bad. You get capsules from a few machines scattered on the board, just like these toy machines in shops, which, as a matter of fact, are pretty popular among kids in Japan where it's called "gachapon". 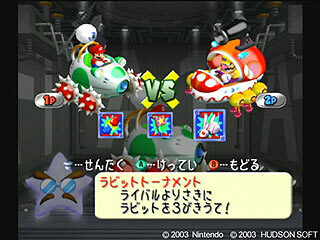 Capsules can take a bit of your precious time to use, especially when the computer is playing, but it's not too long, nothing like Mario Party 4's lenghty scenes, like the genie appearing for instance. 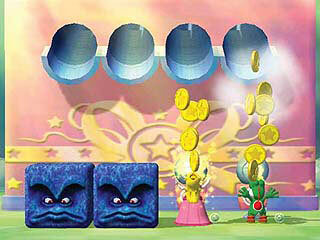 And about the genie, in Mario Party 5, such strong powers are much less easy to obtain. The game's balance has been well improved. Another addition on the board is Donkey Kong who now has his own event space where different things happen. However, DK is not that popular that he can be both a player and an event, and thus... he is not anymore a playable character. That will break some hearts but it didn't break ours at all as we were really satisfied with the changes: Hudson did not only remove a character, they added three ! 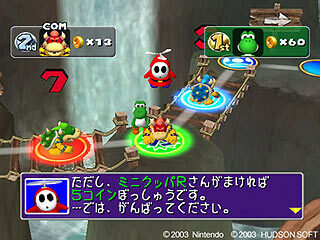 The three new buddies were some of those who hosted the boards in the past version: Toad, Boo and Mini-Bowser. Very different characters and very nice to play with. 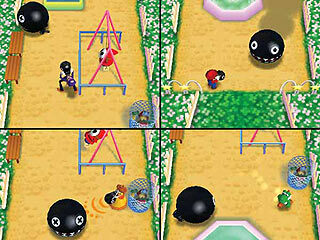 Eight selectable characters is not a revolution but it will definitely cheer you up even if you're a big ape's fan. The boards are great too, they are slightly smaller than before I suspect but there's one more to choose from, and they are really fun to play. There's diversity within, an often exquisite designing taste (literally for the Sweet Board) and plesant humorous touches. Among mini-games, as usual, there's some good and bad, some games which merely rely on luck (like this one race where the name of your flying machine will determine if you win or not !) and some others on skill and practise. But this time, there are only a very few bad games and even these can be entertaining once in a while. All of them have a nice polished presentation with sometimes lots of things happening in the background. 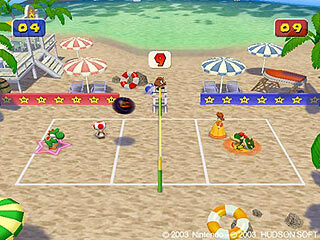 Some games also are randomly generated, like Hotel Goomba, hopefully this will become a standard for next Mario Parties. Unlike the Party Mode the Story Mode has been totally revamped. The story itself is pretty weak as usual, but still funny, it'll make you smile. 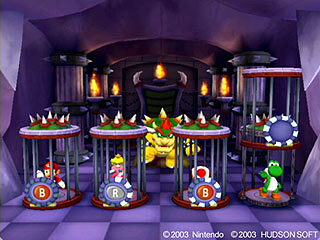 Bowser is trying to conquer the Dream Depot with Mini-Bowser at his side to make their dreams come true. What's Bowser dream ? 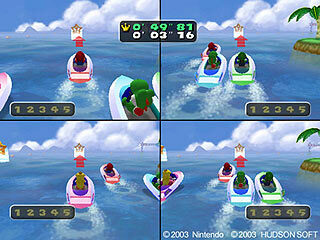 Play and you'll find out, just don't expect anything nasty, we're in Mario Party. 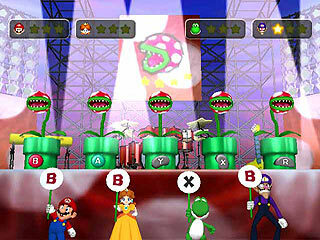 In this new Story Mode, you compete against three Mini-Bowsers (called RGB... yeah, Red, Green, Blue ! Ha ha ha) on a portion, about half or less, of 5 boards. 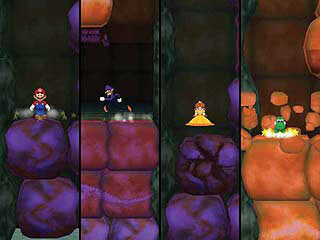 The three Mini-Bowsers cast the dice and move at the same time and you only play duel, 1 vs 3 or 2 vs 2 mini-games. An extra character comes to help you to play this latter match mode. There's no star to collect, you just need to defeat all the Mini-Bowsers, each time one of them loses all his coin he quits the party. When you finished a board, you receive a rank, I didn't really understand what makes you get a A rank, maybe not to lose a single mini-game. 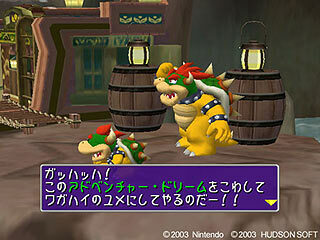 The very final stage is a confrontation with Bowser, it's maybe not as impressive and creative as Bowser's giant die in Mario Party 4, but it's still very cool. And this time, you can play it in the Mini-Games Mode. 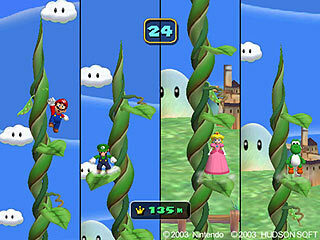 In addition to the main modes, you have three other game modes, and for once, each of them is fairly interesting. The most innovative is surely the Super Duel Mode of which we'll talk last. First, let's talk of the Bonus Mode. In this one, you can choose among three extra games (and maybe some secret ones too...). 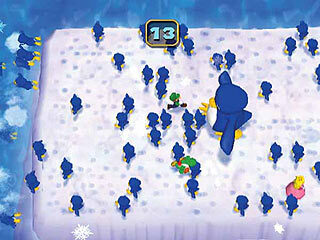 The ice hockey game is quick and simple but not as entertaining as the beach volley game which plays better than in Mario Party 4. 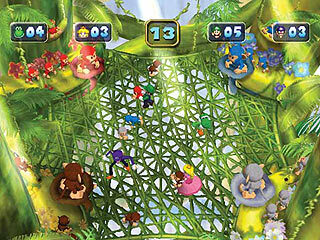 The controls are intuitive and you can select among three different balls to spice up the matches. The last of the three, the card game, is a bit difficult to explain in a few words. It's like old board games except that the board is made of cards that turn when you move on them, you get bonuses or handicaps, it ends when all stars have been found and the winner is the one who collected the most. Given your mood or your intentions, all of the three games can be interesting to play although the volley ball is the best. In the Mini-Games Mode now, not only can you play all the mini-games you unlocked but you also play them in special situations: Tournament, Wars, Decathlon, Circuit or Battle, there's plenty of choice and a good deal of fun. Tournament is exactly what its name hints, you fight your way to the cup in duel mini-games, it's only for 4 contestants so it's very short. In Wars, you need to cover the most space of your color by winning mini-games. In Decathlon, you compete for points in 10 mini-games. It's always the same games and always the same order sadly, yet it's one of the best, along with Circuit, in which the board is replaced with a racing track and characters are put in cars. The last game mode finally, Super Duel Mode is quite sophisticated. Here, you build your own robot vehicle and challenge a computer or human player in an arena ! The more mini-games you played in other modes, the more money you'll have to buy all sort of parts to make the robot of your dreams. The main problem is that all these parts are very unbalanced, so that a robot will hardly stand a chance against an opponent with better and more expensive parts. Nonetheless, it's a nice idea and it gives even more diversity to a game already packed with it. Indeed this new Mario Party has a lot of content, several modes each full of mini-games, possibilities and things to enjoy. It seems even more game-oriented than before with less text and cinematics between you and the fun, and more type of games. It's good and it does make a difference compared to past incarnations. Hudson also took a risk by changing regular elements like the characters and the Story Mode, in the end, it appears like good choices. The changes in Story Mode might not appeal to everyone but they have three major assets: they make this mode much faster, perhaps more interesting thanks to the rank system and they allow you to play mini-games you have less chances to get normally. Mario Party 5 has been a very good surprise this year, if you usually like the series but haven't bought it yet because many critics were harsh with it, give it a second thought, you won't be disappointed, our word on it ! "Mario and his closest friends are trying to restore peace to Dream World by racing around a collection of all-new game boards--and tons of surprises await! The new game sports new game boards, more than 60 new mini-games, new playable characters, an expanded one-player mode and, of course, the multi-player madness that made the series famous in the first place. 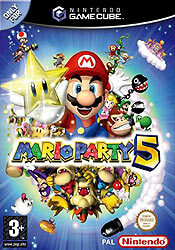 This sequel extends Mario Party's reign as the king of the party game!" "- Change the location of event spaces on the virtual game board to get a leg up on your competition and race to collect more stars than anyone else. 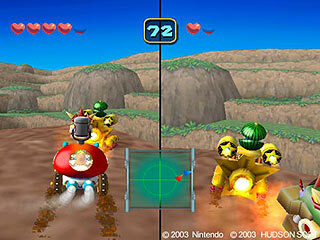 - Duke it out in new duel, traditional or everyone-vs.-Bowser mini-games. 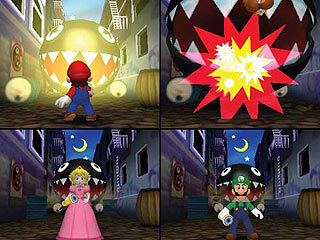 - Have fun with everyone's favorite characters, as well as some new ones debuting in their first Mario game. 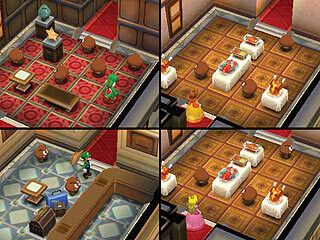 - View the game board with ease and get back to the game faster with the new 3-D maps. - Compete against the Koopa Kid Brigade -- a trio of Koopa Kids who take their turns simultaneously, cutting down significantly on the wait time and letting everyone get back to the action more quickly. - Win mini-game competitions to collect coins and reach stars that are randomly placed on the game boards. 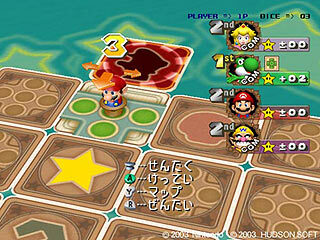 Collect the most stars and coins to win a game board. Beat all the game boards and win the game!"